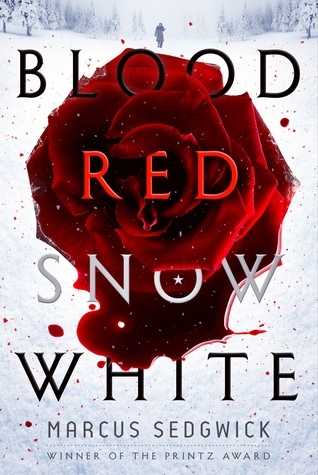 Blood Red Snow White by Marcus Sedgwick. Roaring Book Press, 2016. Ebook. 320 pages. Before I dive in, I would like to note my initial confusion over this title. I had not heard of this book when I came across it, and I assumed it was a new, unreleased upcoming book, but I soon realized that it has in fact already been published, and that this will be a re-publication. I am not sure why this is the case, but I am still glad to have had the opportunity to read it! Now, on to the review! The first half of Blood Red Snow White was stunning and magical and I was immediately drawn into Sedwick's gorgeous fairy tale-like prose. His prose was dazzling and took me to a warm, cozy place that I looked forward to reading more of. This was the part that included the fairy tale retelling and, in my opinion, the best parts of the entire book. However, once I hit the halfway mark when the fairy tale neared its end, the charm started to wear off and I found myself feeling lost and unsure if I was reading the same book that I was reading when I felt so charmed by it. Things got confusing, and I found myself feeling somewhat bored, almost wishing for the book to hurry up and finish. I no longer cared much for our main character - Arthur Ransome's - struggles and story. It felt like it was both stretched out and too hasty at the same time. I intended to write a bit more about Arthur's character, but I'm suddenly finding myself coming up short on things to say. That's not to say Arthur was a bad character - he had some redeeming quirks and qualities - but he wasn't exceptionally interesting, and sadly, he doesn't really stand out to me. What I admire about Sedgwick is his courage and complete lack of fear. He seems unafraid to try out new stories and writing styles, and I admire and appreciate that about him; in fact, it is partly what drew me into this book and prompted me to continue reading it despite my occasional lack of interest. And despite my 'meh' feeling about the end of this book, I will definitely be looking into more of Sedgwick's works, as I would love to see what else he can do with his wonderful writing abilities. Overall, I am giving Blood Red Snow White three-and-a-half stars.